No, this is not a sequel to Trains, Planes and Automobiles, Race Directors should be prepared to receive questions about what is and isn’t allowed on race day. Increasingly there is a demand for music, kids and pets to accompany racers during a race. Each of these requests carries unique safety challenges that should be carefully evaluated by race directors before deciding that anything goes. Fitness strollers have made running and biking with your newborn a possibility for many new parents. Many races have differing policies on whether or not to allow strollers. After getting burned a few times these young parents will be sure to ask each race they enter about their stroller policy. If you do decide to allow strollers into your race consider encouraging strollers to start towards the back of the pack or creating a stroller start time that is slightly behind the other racers. As those babes age and start walking or running, parents will want to bring them to the races (how else do you tire those things out?). When walking or running a race you may receive questions from these parents asking whether or not they have to pay an extra entry fee for their young child. For most races this is not a demanding request but it won’t be appropriate for all types of races. Music helps many runners enjoy the activity a little more than usual. Headphones can pose a serious safety challenge as these runners lose their ability to hear and react to the environment around them. For that reason, most races try to enforce a no headphones policy to protect all racers. 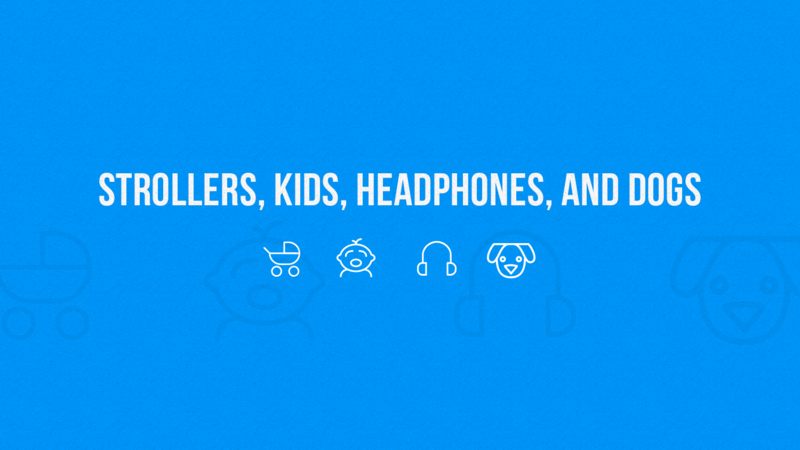 Be prepared for questions about music or be proactive and display your no headphones policy prominently on your website. Like with music, some runners enjoy their daily run with a four-legged friend. Pet owners may be worried to leave their dog at home alone for several hours while they compete in a race. While seemingly harmless, some participants have serious fears of dogs and it could impact their race experience. Be sure to consider these risks when deciding on a pet policy for your race. What else are participants asking to bring with them to races? Reach out to our social team (social@raceroster.com) with some of the requests you have received in your event lead up.